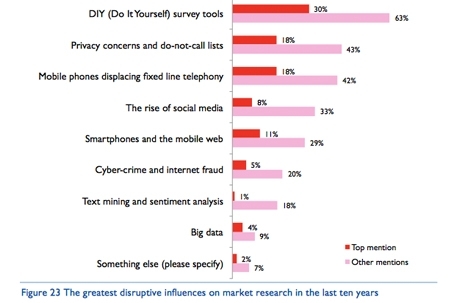 UK — DIY surveys, data privacy and the displacement of fixed-line telephony have been the key challenges to market research over the last decade, according to survey findings. The tenth annual Confirmit Market Research Technology and Innovation Survey, conducted with 240 market research firms globally and produced by meaning ltd, also revealed that mobile technology, social media and multi-modal research had been the most positive technological developments in research over the past decade. The report also noted that there has been a significant shift by research companies towards working with businesses on voice of the consumer (VoC) and customer experience management (CEM) programmes. Tim Macer, managing director at meaning said: “The research industry clearly is adapting to the new data-rich, ‘always on’ landscape that we find ourselves in today. VoC is a natural place for research companies to be, but it will not be credible or sustainable if the industry does not embrace innovative methods to deliver a more holistic and integrated product.